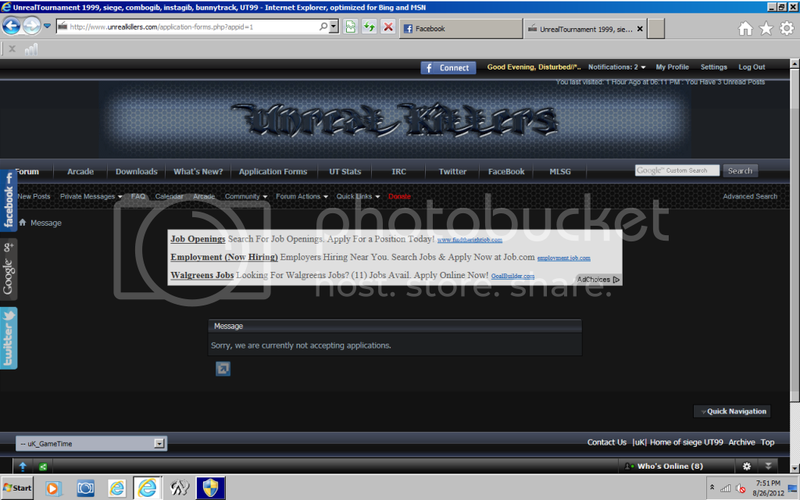 Application forms are now live on the forum. We are currently recruiting server moderators for combogib and instagib us (when back online). This will be official route of applying for a moderator position now. In the near future this will also be the default way to process member applications. Sorry, we are currently not accepting applications?? Is that suppose to be showing? Will current mods have to fill out an application as well? @lotrfan shouldn't do that I'll have a look tomorrow. Maybe instead of IG(Since there are plenty mods for IG) we do this for Siege? Personally i think we need more MODS on siege sever. Maybe put the Application tab back on @SAM make it for Siege? I think a mod should be nominated for siege servers, maybe busta, scourge, convict, someone who isn't caught up in drama, someone with a good presence on the servers, someone who will criticise their own team, and can make fair criticisms. In my experience the best moderators are the ones picked, not the ones who are after moderator powers.